The British Gazette » The Unapool Unicorn. Above Eddrachillis Bay, Sutherland. 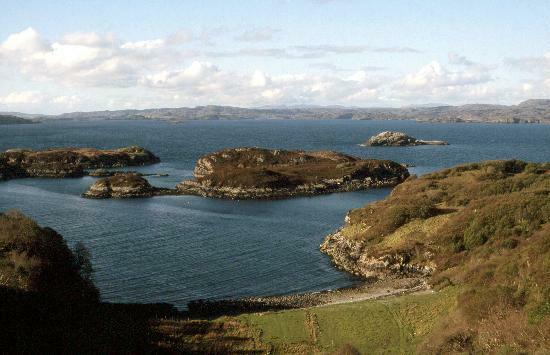 Unapool, a nearby hamlet sits within an open landscape of breathtaking coastal views, lochs and mountains. It is a wild and remote area. Walk into that empty landscape and if one has imbibed enough Scotch, you might spot one of the elusive unicorns that are known to inhabit the area. These fantastical creatures of course, not only can run faster than Tiger Roll, the winner of the 2019 Grand National, but having wings can fly! One must NEVER kill a unicorn of course. But if one allows you to scrape a tiny little piece from it’s horn, taken, it can grant immortality! Once possessed of the gift of immortality, the unicorn – which has the power of speech bye the way – will grant the new immortal any wish! Which is why powdered unicorn horn is so sought after! Unicorns of course are shy creatures. This means that whilst they live in the constituency of Caithness, Sutherland and Easter Ross whose MP is Jamie Stone of the Scottish Liberal Democrats, they most definitely do not live in the constituency of Uxbridge and South Ruislip whose MP is Boris the Buffoon. This of course is a problem as the Buffoon is desperately seeking a unicorn to enable him to be leader of the Tory party and to give the British People the Perfect Brexit! The Perfect Brexit is a Brexit where the UK leaves the EU, leaves the [EU's] Customs Union, leaves the Single Market (EEA) and negotiates a “Free Trade Agreement” that gives the UK all the advantages of the aforementioned without any of the costs or burdens such as accepting Free Movement [of people]. What people in Ireland have termed, a “Unicorn Brexit”. ~ we turned our attention to Labour and it’s fantasy agreements. It seems the British People (at least the good people of Newport) have begun to see through their politicians. IF I was a Labour Party member, I would be as sick as a parrot! The book, “Rules of British Politics” states quite clearly that parties riven with the internal turmoil of the Tories are enduring are destined to be wiped out at the ballot box. However, the Newport result does NOT indicate this! The Tories will be greatly heartened by this result. UKIP polled 1.86 times the remainiac Dim-Libs vote. This is Very Good News! This result may well encourage Madame to prevaricate and seek to manoeuvre Labour into a position where they are made to carry the can of a Brexit betrayal. The one thing the Tories will be desperate to avoid is a hard Brexit. There is NO certainty that the EU27 will grant Madame an extension on the 10th April. Remember, ALL 27 member states have to agree. IF Macron decided to say “Non” then that would appear to be it. However, there are indications that there could be a slight extension to enable final preparations for a crash out to be made – by all parties. OK then: let us consider this hypothetical scenario: Madame is told “Non” and is granted a stay of execution until Friday 26th. Given the woman’s determination, I would not be one bit surprised if she attempts to put forward the Meaningless Vote back before the Commons in an attempt to have it passed and then ask for an emergency EU summit to agree an A50 extension. The Commons however might have other ideas. They may put through a Bill which will become an Act, requiring Madame to revoke A50 and remain in the EU – cancel Brexit in other words. This is EXACTLY what the EU and Madame would have been waiting for! The necessary authority to betray the clearly expressed democratic wish of the British People! For myself, I think that if this happens, history should record this parliament as “The Remainer Parliament”. Madame would then quit as PM – the personal stress levels must be colossal. The Tories would then elect a new leader (Boris the Buffoon?) and they will then call a General Election. The Tories would argue that the Brexit betrayal is down to Labour and the Dim-Libs and Labour and the Dim-Libs will argue that the Brexit betrayal is down to the Tories incompetent handling of the issue. UKIP’s biggest problem will be Narcissistic Nigel and the Brexit Party – aka the Nigel Farage Appreciation Society.